The 1st and the Original ONLINE MIXING and MASTERING.COM since 2006. 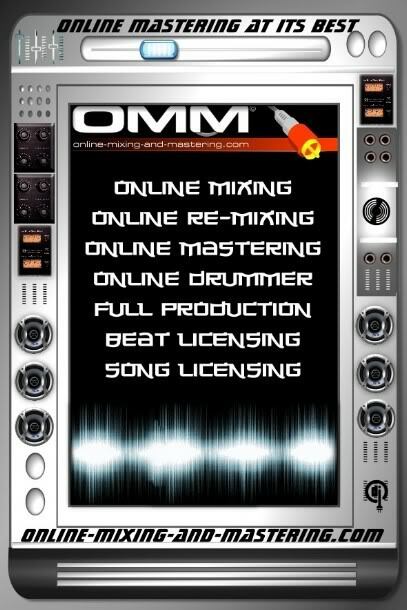 Online Mixing and Mastering is the New Online Solution for the Independent or Signed Artist. Online Mixing and Mastering is the new All In One production service for the Artist that wants top quality sound for reasonable prices. There are millions of talented Indie and Signed Artists online on 1000´s of music sites on the Internet. Many of these artists are very talented, but are lacking in mixing and mastering skills. Some of these artists are making CD´s to sell at stores, gigs, and on iTunes, while others just want their songs to sound the best they possibly can, but can´t afford expensive studio prices. Online Mixing and Mastering is the solution to this problem. Online Mixing and Mastering specializes in the mastering of CDs and individual songs, but also offers a bundle of other services, such as mixing, editing; remixing, online drummer, audio restoration, radio spots & jingles, DJ services, live recording, and full production services. FREE evaluation of your Mix. FREE mp3 sample of our work on your project for you to approve, before payment. Easy Payment with Pay Pal. All payments with PayPal. Free Sample MP3 before you pay. Once you are 100% satisfied and have made payment, we will immediately send you the mastered, or mixed and mastered WAV file. Our business is built on a long line of satisfied customers. We can professionally mix and master your audio recordings online for a fraction of the normal price it would cost you to book our studio for a mixing/mastering session. We have acoustically optimized studios equipped with the latest digital and audio technology; combined with an expert team of experienced audio engineers to guarantee an optimal sound experience. Professional mixing is a science, that requires many years of experience, an optimal acoustic environment, top equipment, and a great pair of ears. Having an acoustically tuned environment that you are acustomed to working in is one of the main keys to getting a successful mix/master. All tracks individually (mono or stereo) without any effects(unless it´s something you can´t live without) in a 16, 24-bit (floating point) WAV data format. We prefer 24/48 Khz tracks bounced at -3 db. In the mixdown we use a combination of analog and digital equipment. The digital mixdown makes a “total reset” possible, so that we can reconstruct every mixdown immediately. With our analog equipment, we create a sound which is still unmatched in the digital world. You have the choice to send us the data online, or DVD, CDR by mail. You will receive your song mixed and mastered either online and/or sent as an audio CD by mail. What genres of music do we mix and master? We´ve mixed and mastered 1000´s of songs in all genres of music from Hip Hop, Rap, R&B, Soul, Funk, Rock, Progressive Rock, Metal, Pop, Orchestral, Electronic, Club, Dance, House, Drum & Bass, Jazz, Jazz Fusion, New Age, World, Afro-Beat, just to name a few. Be sure to check out our “References” page, and the links to the music of some of our satisfied customers. There are also 2 links on our front page to our My Space pages with lots of examples to listen too. We will mix and master your song for the package price of 175.€ (maximum 24 tracks) More than 5 songs, only 150.€ per song. (maximum 24 tracks). Please sign up for our OMM Newsletter for Updates and Special Offers. Radio Spots and Jingles: Let us create the perfect Radio Spot or Jingle for your business, service, etc. Sound Replacement: replace the sounds of your midi tracks with the best sounds available on the market today. in 24 bit sound quality. Online studio musician: horn sections & soloists, guitarists, keyboarders, bassists, drummers, in any style you need. recorded in 24 bit sound quality. Dutty Devioso’s album “Up The Ante” was mastered by “Mastering Guru” Dicarlo at OMM. Dicarlo’s mastering really brought out the characteristics and dynamics of each track. Dicarlo is such a perfectionist. He wants to nail each track perfectly. He makes sure you are completely satisfied with each track, while offering valuable tips and tricks you can do in the mix process. Bottom Line: If you want industry level masters, Dicarlo is you man… Look No Further!!! (Dicarlo also mixes and produces as well) “Total Package” – Thanks for making Dutty Devioso’s Album “Up The Ante” A Classic & One of the Best Independent “Hip-Hop/Rap” Albums of The Year.